This has a complete balance of all the vitamins/minerals your body needs with a great selection of herbs that gives you that nice boast of energy to help start your day off. This will also help give a man fresh stamina improve your health and just feel good all over. Sexual energy and stamina is a result of this product for men. 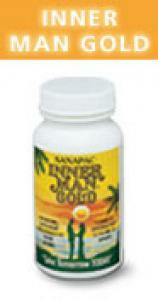 Unlike chemically based drug products that may produce side effects, Inner Man Gold feeds the body the nutrients essential to regain its defenses. With time you may see improvement in body function, stamina and sexual performance. It contains some of these elements: Yohimbe Bark, Damania Aphrodsia, Royal Jelly (3x), Gensing, Fo Ti, Oyster Extract, Bee Pollen, Garlic Powder, Muria Prima, Sarsparilla, Kola Nut, Gotu Kola, Capsicum, Kelp, Ginger Root, Saw Palmetto, Goldenrod, Vitamins A and C, Thiamin, Riboflavin, Niacin, Calcium, Ferrous Sulphate, Vitamins D, E and B6, Folic Acid, B12, Potassium, Magnesium, Zinc, Chromium, Selinum, Copper, Biotin, Pantothentic Acid, Co-enzyme Q10, Oyster Extract, Brewer's Yeast, Choline Bitrate, Inositol, Caffeine Anhydrous, Lethicin, Paba, Potassium Gluconate and Manganese Gluconate and Co-enzyme Q-10. Some studies have demonstrated that Chromium may provide benefits including weight loss, lowered serum cholesterol and glucose, burned fat and increased muscle. Researchers have several concerns about the Picolinate form of Chromium. Since it may alter levels of neurotransmitters, some experts think that it may harm individuals with depression, bipolar disease or schizophrenia. A report of a severe skin reaction caused by Chromium Picolinate is another concern. It has also been postulated, though not yet proven, that Chromium may cause adverse effects on DNA. Bladderwrack is a form of kelp, and has been used medicinally for centuries. The main use of the herb has been to stimulate the thyroid gland as a way to address obesity and cellulite. Also indicated for adrenal glands, arteries, asthma, colitis, constipation, diarrhea, eczema, gallbladder, hair loss, headaches, high blood pressure, kidney, liver and prostate health, lead poisoning, morning sickness, nervous disorders, neuritis, pancreas, pituitary gland, skin problems, tumors, vitality, water retention and wind. Royal Jelly is a honey bee secretion. Research has already disproved, or is needed to confirm or disprove, many of the purported health claims. To date, there is only preliminary evidence that it may have some cholesterol-lowering effects, as well as anti-cancer, anti-inflammatory, wound-healing and antibiotic effects, though the last three of these effects are unlikely to be realized if ingested. Pantothenic Acid, also called Vitamin B5, is a key component in the metabolism and synthesis of carbohydrates, proteins and fats. Small quantities of Pantothenic Acid are found in nearly every food (hence the name), with high amounts in whole grains, eggs and meat. Many energy drinks now contain Pantothenic Acid. It is often prescribed for hair and skin care, and particularly for acne, with mixed results. Capsaicin in cayenne pepper is believed to have very powerful pain-relieving properties when applied to the surface of the skin. For this reason, it is currently used in topical ointments to relieve the pain of peripheral neuropathy, such as post-herpetic neuralgia caused by shingles. Early evidence is encouraging regarding the possible use of Capsaicin for stomach ulcers. Capsaicin is being explored as a cure for diabetes by researchers in Canada. Early work curing diabetic mice looks promising. The American Association for Cancer Research reports studies suggesting Capsaicin is able to kill prostate cancer cells. The indigenous peoples of North America used the fruit of the Saw Palmetto plant for food, but also in addressing a variety of urinary and reproductive system problems. Europeans learned that it may be used as a nervine, sedative, expectorant and digestive aid. In an age when even serious politicians admit to relying on male enhancement drugs to feel more confident, we may speak frankly about these products, and therefore determine which may be effective and which may not. We suggest researching each ingredient, and reading as much as you may about the product.